Set in a secular pine forest and facing the Ionian sea, the La Plage Resort is a 5 star hotel in Taormina that provides a luxury and contemporary atmosphere thanks also to a minimalist furnishing in every room and public space, with all the comforts of a 5-star hotel in each of the 61 rooms divided in bungalows and Suites. All the bungalows of the La Plage Resort are 21 square meters with double bed and showers in their bathrooms, some of them offer a nice sea view from their outdoor gardens while others offer a nice outdoor mini-pool, features that make our resort an unforgettable 5 star hotel in Taormina. Book now your stay at the La Plage Resort and you will have the best sicilian experience you could have dreamed of: immerse in a stunning environment in the very heart of this pearl of southern Italy. 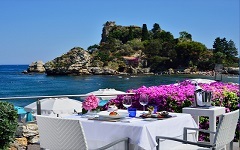 Choose our 5 star hotel, Taormina will give you all its best.